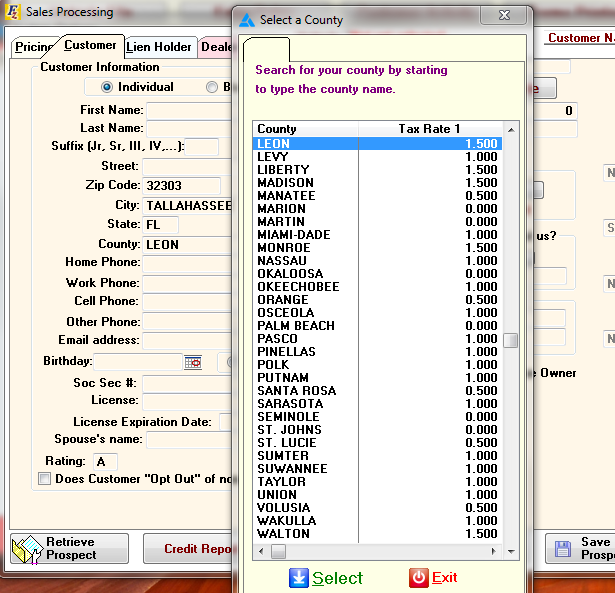 Frazer Tax Rates for Florida are pre-set. Frazer calculates Sales Tax based on the county that the customer lives. When the customers zip code is entered, this will happen automatically. No changes are required in your system options. Frazer tracks all Doc Stamps charged to customers. 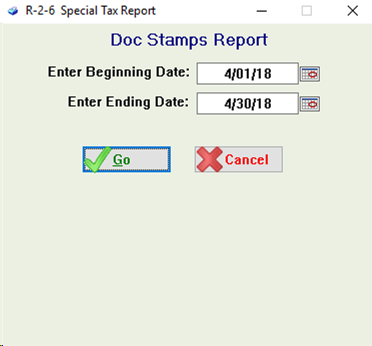 The report is available from Reports >> 2 - Sales Reports >> 6 - Doc Stamps Report. 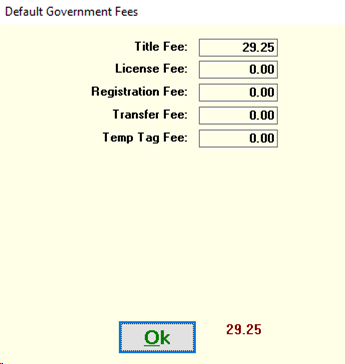 It will print a list of Doc Stamps charged to customers over a specific date range of sales. The system defaults the Doc Stamp rate to 35 cents per $100. This does not need to be changed. A dealer MUST collect Doc Stamps when they contract the customer. If they do not want to charge them to the customer because the customer is bringing their own money from a bank or CU then they must do a cash sale and attach the proper lienholder if necessary. OR They can check the checkbox at the bottom of the lienholder/advanced tab. Pickup Notes - Pickup Note amounts ARE charged doc stamps as are all payments that are due. Frazer offers 4 integrations for your Temp Tags and Online Registration in Florida. 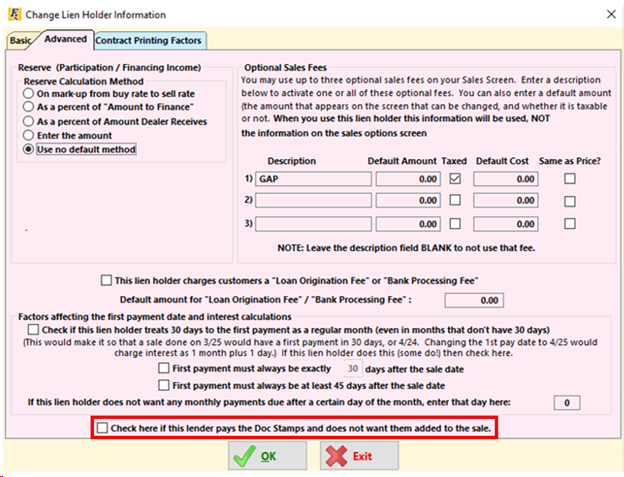 Select which default company you are working with in your System Options on Tab 6 - Printing Options. If you are working with TitleTec, make sure you enter your username and password. 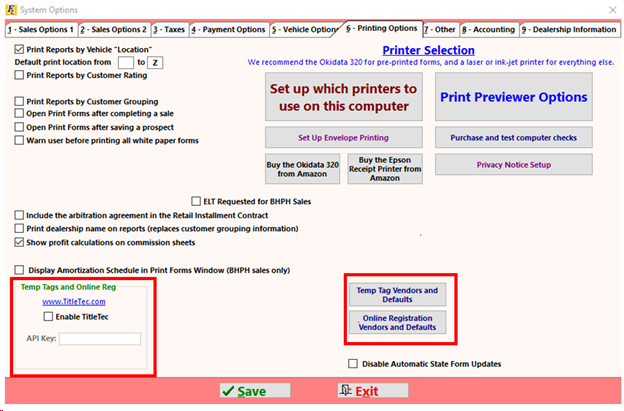 Once your defaults are selected, you can select Print Temp Tags...or Online Registration right from the Forms Printing screen, which will automatically send your customers information.